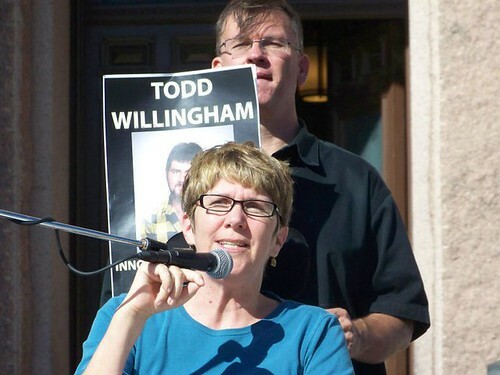 Before his execution, Todd Willingham said, “Please don’t ever stop fighting to vindicate me.” On October 30, 2010 hundreds of people joined the fight by attending the 11th Annual March to Abolish the Death Penalty at the Texas Capitol in Austin. 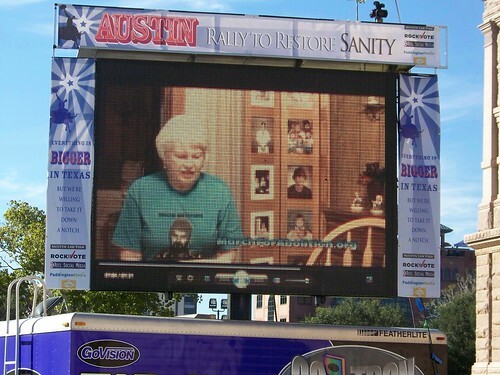 In the photo above, Eugenia Willingham is speaking on the giant Jumbotron to the crowd at the 11th Annual March to Abolish the Death Penalty. Her remarks included reading an excerpt from a letter written by Todd Willingham. She said Todd’s dream was to abolish the death penalty and she hoped we could all work together to make Todd’s dream come true. The 11th Annual March to Abolish the Death Penalty was held in Austin at the Texas Capitol October 30, 2010. Elizabeth Gilbert also spoke at the 11th Annual March to Abolish the Death Penalty. Elizabeth is a Houston teacher and playwright who befriended Texas death row prisoner Todd Willingham. Her story is featured in the New Yorker article by David Grann about the case as well at the Frontline Documentary “Death by Fire” (Click to watch online). Elizabeth actively investigated the case on her own. She became convinced of Todd’s innocence and was instrumental in helping his family find an expert fire investigator to examine his case.